I decided I would like some separates in the wardrobe, so turned to some TNT patterns to make them. The first of the three I made was the Nina Stylearc Cardigan. I have made this before but not blogged about it. This one was made in needle knit stripe from The Fabric Store, which I had in the stash. Pretty similar to this one I think, but a pretty blue. I had to study up on how to do a rolled hem around a corner as that is how I chose to hem the cardigan. 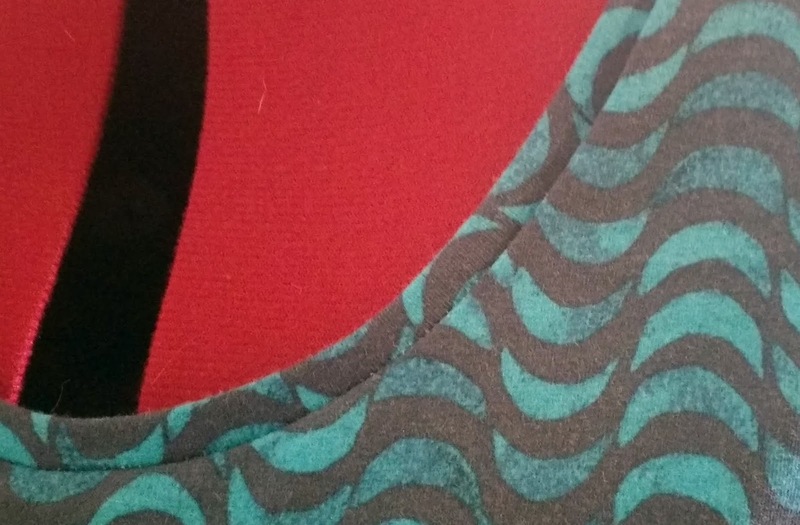 I didn't hem the last one as it was a heavier weight merino and I felt I didn't need it. I referred to the technique in Easy Guide to Serging Fine Fabrics and practised it a few times, then took a deep breath and went in. I was pretty happy with the result. This cardigan has worked really well and will be a great travel cardi as it is very lightweight but provides a nice amount of warmth for it's weight. 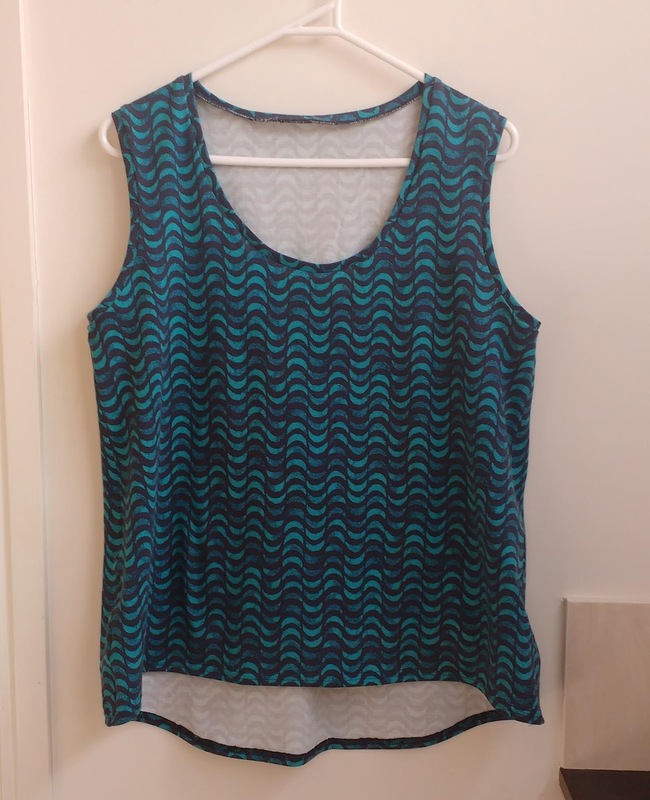 The second item was the Stylearc Evie top. I have made this twice before but not blogged them. 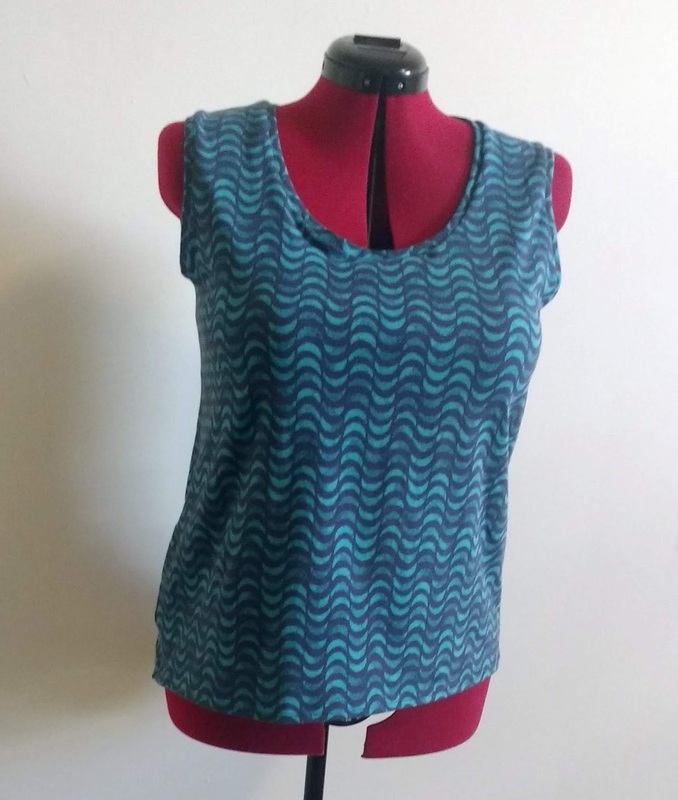 This is the first one I made in an Art Gallery knit from Wattle Hill Fabrics. 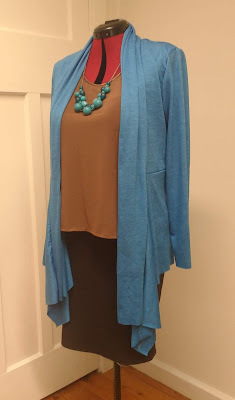 This is a great basic tee perfect for layering. The fabric I used for this third one was stash fabric again. A remnant piece of pretty ugly brown jersey. I think I have used the rest of it for lining a dress. 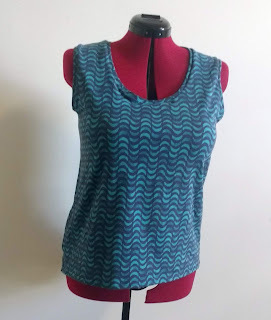 This remnant has been hanging about for a while and even though it is never going to be a favourite it will help fill my wardrobe while I am catching up with sewing new clothes. The of-interest part of this make is that I didn't bother with binding, but used FOE (fold over elastic) instead. I used the shiny side as it matched the colour of the fabric the best. All these three items will mix and match with other pieces in the wardrobe. I see the cardigan and the skirt becoming favourites but the brown top will probably stay until I make more tops I really like so I can move it on. 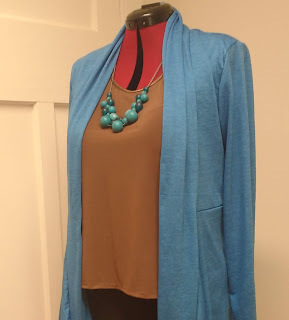 By itself the brown top may not be too interesting but with the blue cardigan and turquoise necklace it makes an outfit where the colors sing! That top is so cute, such a chic style thats very wearable. What a great clothing patterns tutorial. I really like your project. Well-chosen material and color. I like these colors the most! Very good job. Congratulations.